Typical scene in the backyard this past week. I would like to take a small diversion from my usual material on this blog to do a little backyard natural history. Our new home has almost a half acre of grass which abuts to our neighbors yard which is several acres of hardwood forest. In researching our home I found out that our backyard too was mostly forest up until at least 2008 when the trees were removed and grass planted. The grass was well maintained by a lawn service and so there are no weeds but there are many small patches of decayed grass or no grass at all. The soil quality obviously varies across the yard. I believe this is because the former owners must have brought in top soil and spread it over what was the forest floor in order to plant the grass. That layer of topsoil seems very thin and what has become apparent this first fall we are in the house is that there is an amazing diversity of fungi in the yard. These fungi are probably from two sources: first there was probably a diverse set of fungi that lived in the organic rich forest floor and are helping to rot the many roots of the trees that had been cut down. 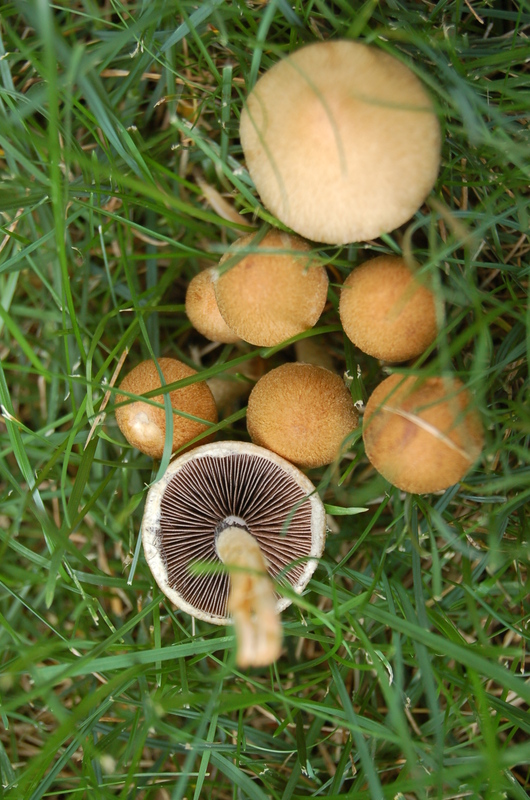 Secondly there are probably some common fungi that were imported with the topsoil that was used to prepare the yard for planting grass. 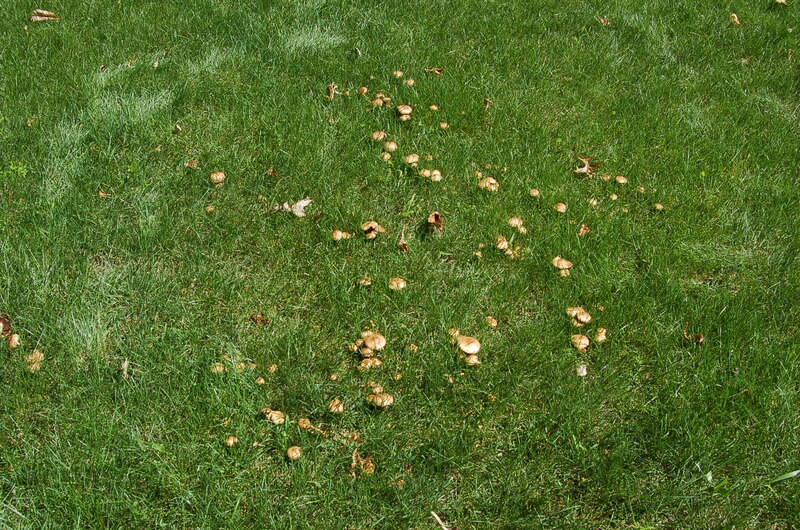 The result is that we now have thousands of mushroom poking up their heads through the grass. What were small barren spots now bear hundreds of puffball fungi providing some explanation for these patches seemingly random appearance in the lawn. Below are a few pictures of what I have seen in just one week of walking around the yard. 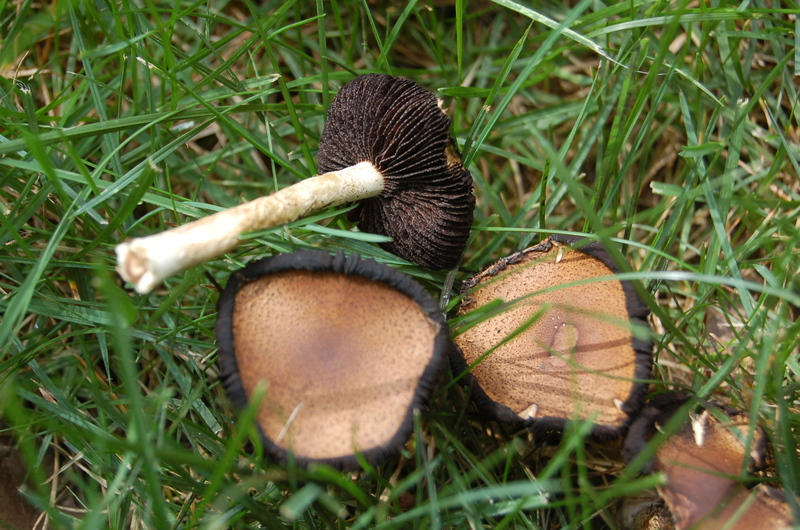 There were a minimum of 500 of these common fungi. They appeared over 2 days about 4 days after a good rain and were gone another 2-3 days after their appearance. 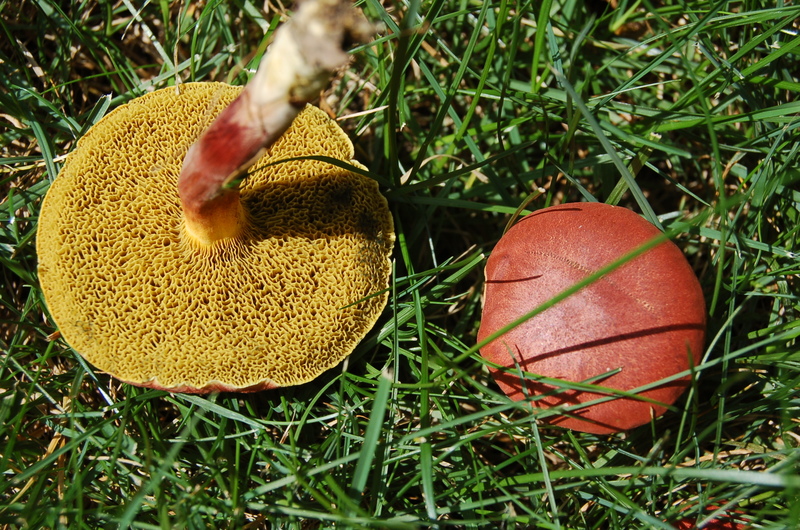 I have not been able to figure out what type of mushroom this is despite using several keys but there are another 500+ of these in several patches. Another common taxa found in the yard. It clearly was different than the first because I found it intermingled with that one and it was clearly distinguishable. This is probably Boletus bicolor. 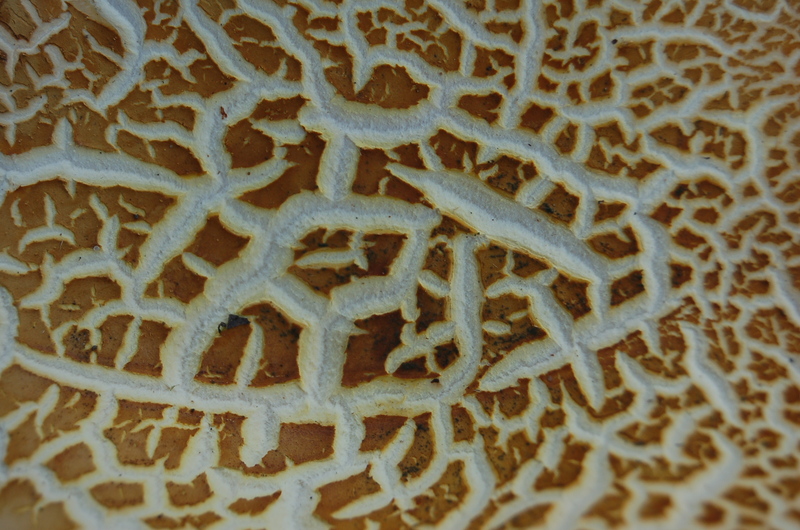 This Boletus species stains blue when touched (dark marks are where I touched it bottom turning it over). Again, several hundred of these. This one is about 3 inches in diameter but most were the size of a quarter. The distinctive blue stain isn’t seen here because I was careful not to touch the bottom when I turned it over. 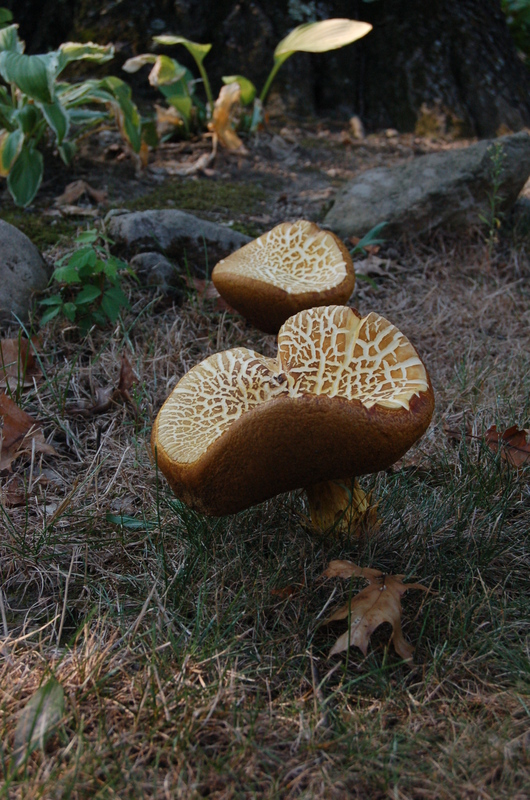 There were about 8 of these spectacular Bolete type mushrooms in the front yard growing from very poor hard soil. These took about a week to mature before finally decaying quickly. These shelf fungi intrigued me when I first saw them and I still am not sure how to explain them. These have grown over the last two months. You can see the grass doesn’t look so good here but is surrounded by very nice grass. I would guess that this is where a tree once stood and although the stump might have been ground down enough of it was left that as it has rotted these fungi have protruded from the rim of the base of the tree. What I can’t figure out is why all the “shelves” are facing the north. Given they aren’t coming out of the side of a tree I would have expected them to be rounder but they all take on this look. Maybe face away from the sun? There is probably some sort of environmental cause for their directionality. 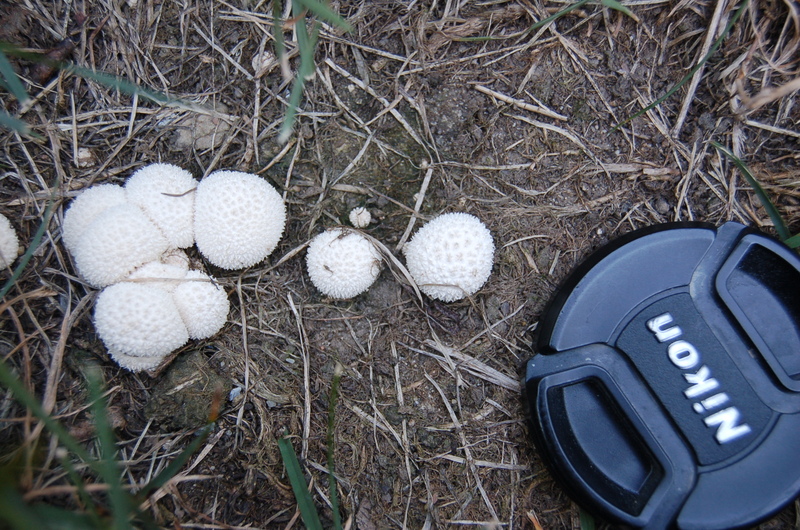 Over the past three days thousands of these small puffball fungi have been appearing. 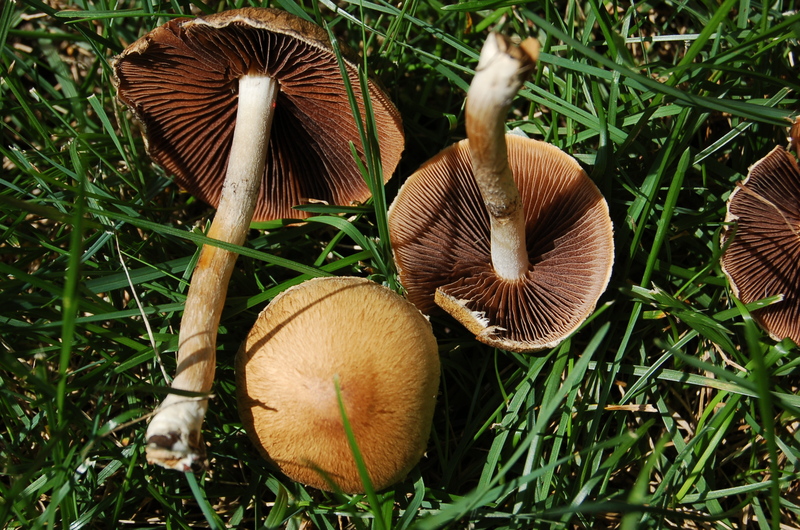 These are near “maturity” when they will turn brown and papery and any drop of wind or kid stepping on them will result in the release of hundreds of thousands of spores. 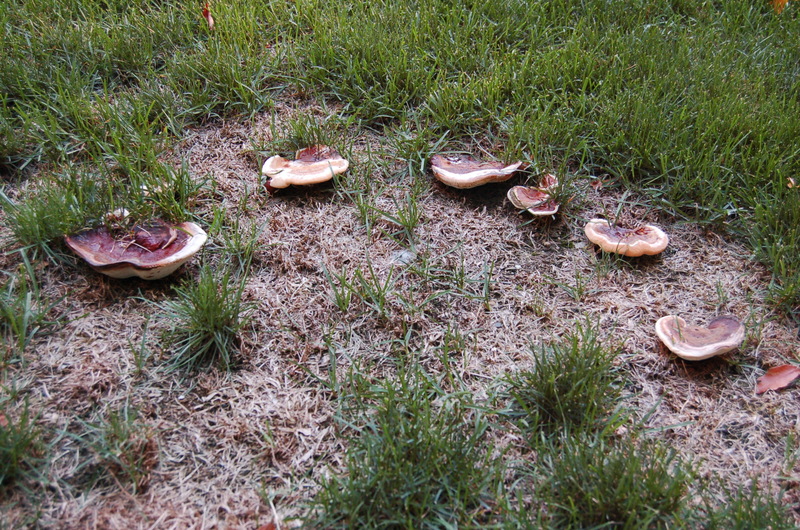 I have found that most of these are forming in groups in small open patches in the lawn suggesting they are either responsible for these barren patches or possibly are just taking advantage of the conditions in these spots. « The Salty Sea Part II: A Young Earth Salt Chronometer? Beautiful photography. The abundance of God’s creation always puts me in awe of Him.